FOMO ... Fear Of Missing Out. Here I am a week from the start of, for me, an epic adventure and what am I thinking about? What I will miss while I'm on the trail. Television ... all sorts of shows that I normally would be glued to every evening. Movies ... "Spider-Man: Homecoming", "Guardians of the Galaxy Vol 2", and several more that I would have enjoyed in glorious IMAX. Concerts ... It's like they knew I was going to be away. Queen (with Adam Lambert), Green Day, Boston, and several more that I can't recall at the moment. Oh yeah ... Jerry Seinfeld!!! Strange how the things you will not be attending always have more allure than what you are actually planning to do ... until you actually do them of course. Photograph: "An Exercise In Color Coordination"
This isn't the best photograph I've ever taken but I took it in a rush on my way out of the Billy Joel concert. 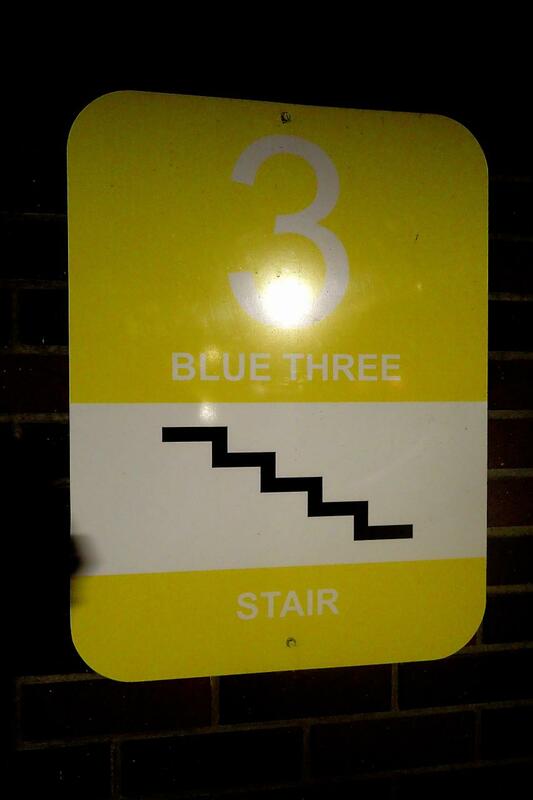 It just struck me odd that a sign for BLUE THREE would be colored yellow. "An exercise in color coordination"
On Friday night the Wife and I drove down to Lincoln, NE to see Billy Joel in concert. It was a rainy drive but it was worth it. There was no warm up act and Billy Joel came on stage shortly after 8:00 PM. From there it was pretty much non-stop entertainment of the highest caliber. He interacted with the audience, kept the mood light and full of humor. Our tickets were up in the nosebleed section and we were beside the stage. This wasn't too bad since the piano was set up so he was facing us. To make it better for the audience, the piano was on a turntable so he would spin the piano around ever so often so everyone got a good look at him playing. 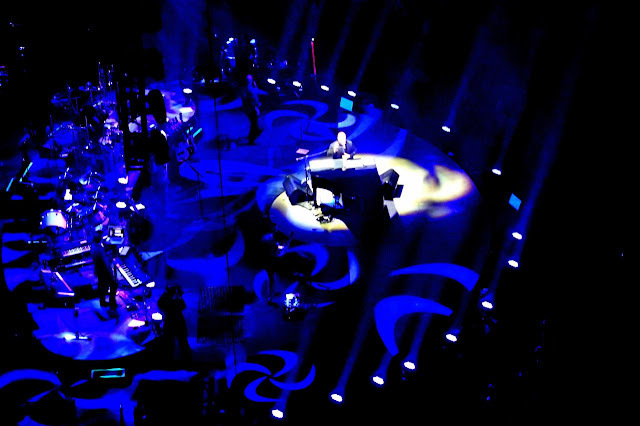 The Billy Joel stage in blue. Early on he offered the audience a choice of songs which was interesting. He then did something unexpected. He let various members of his band perform their own songs. Guitarist Mike Delguidice gave a great operatic performance of Puccini's "Nessun Dorma". Another guitarist, Tommy Byrnes, performed a rockin' rendition of "Johnny B. Goode" as a tribute to Chuck Berry. And kicking off these band performances, guitar roadie "Chainsaw" did an awesome cover of ACDC's "Highway to Hell" (with Billy Joel on guitar). The rest of the night was all Billy Joel and it was incredible. The only thing I hoped for, but didn't get, was new verses of "We Didn't Start the Fire" but that is probably for the better. It was nice to have a couple hours away from politics and the Appalachian Trail and I left the concert a little bit renewed. Photos of the concert can bee seen in my 2017-03-24 Billy Joel Concert, Pinnacle Bank Arena, Lincoln, NE Google Photos album. Two weeks from today I will be starting my Appalachian Trail (AT) hike. Time is flying and the anxiety is reaching a boiling frenzy. I think the anxiety is affecting my writing. I expected to be posting a lot as the AT approached but I'm not. Too worried worrying to write I guess. Preparations are continuing in fits and starts. An hour here. A half hour there. Things are starting to come together. On Sunday I started setting up the shuttle services I'll need. The first is transportation from the Atlanta Airport to the town of Dahlonega on the 4th of April. I'll be spending two nights there. The small college town is not far from the start of the AT and has an outfitter. On the 5th of April I will be visiting said outfitter to buy stove fuel and bear spray along with anything else that I may have forgotten. On the 6th, two weeks from today, I will be picked up by Mama's Taxi and dropped off at Amicalola Falls state park. This is not the start of the AT but it will be my starting point. My first hiking day will be the 9 mile (14.5 km) Springer Mountain approach trail. The trail climbs 1,982 ft (604 m) from the park's visitor's center (where there is a hiker register and a pack scale) to Springer Mountain (the official start of the AT). This week I am finishing preparing resupply packages (buying boxes, printing inventories, and mailing labels). I picked up some first aid supplies and toiletries. There always seems to be something else that I forgot. I had three doctor's appointments this week as well. My eyes are fine, my teeth are clean, and the shot I got seems to have eliminated the pain in the elbow I've been fighting for the past nine months or so. Now all I need is some sleep. Every time I close my eyes I see checklists and lists of checklists. My mind fills up with scenarios - both good and bad - and I think I've already hiked half the AT while laying in bed trying to clear my overactive brain. Lack of good sleep is feeding into my anxiety. I don't remember every being this anxious before. I have always had pre-event jitters but this time it cranked up to eleven. I am really looking forward to finally getting on the trail, into nature, where I can walk off all these nerves. Never Forget To Look Around You. 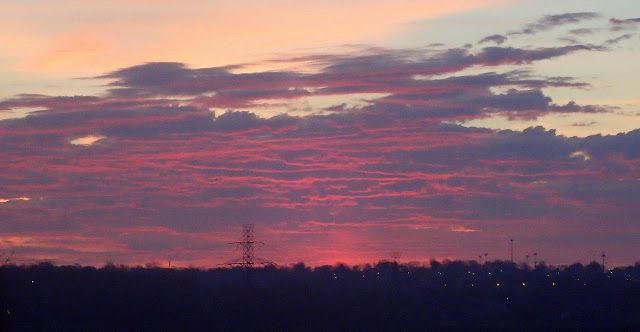 This morning I looked out the window and saw the sunrise for the first time in a long time. As I looked I couldn't remember the last time I enjoyed a sunrise from our back window, It felt good to see the beauty in my own backyard once again. Thinking back I realized the last time I shared a sunrise picture was six years ago in 2011. I think I just stopped looking out the back window in the morning. Never forget to look around you. You never know what amazing things you will find in your backyard. Since I stopped doing the post a day back in January my posting frequency has dropped off a lot. It doesn't mean that I haven't been doing things though. Let's see what have I been doing for the past week. I finished buying all the food I'll need for Appalachian Trail (AT) resupply. I repackaged a bunch of stuff, namely the homemade trail mix and the jerky, into smaller daily rations. I am about two thirds the way through the repackaging. Once I had seven days worth of food in a pile I realized that the bear proof food bag I had would not hold it all so I ordered a second food bag. I suspect that, once full, both food bags will not fit in my backpack so one of the bags will be hanging off the back of my pack. I will probably put 'day' food in the outside bag and night food in the packed bag. Naturally, as I hike, the food bags will empty out by about two pounds of foods per day. Also AT related, I registered my through-hike at the Appalachian Trail Conservancy site. The registration is voluntary and is meant to help spread out the through hikers and prevent large clumps of hikers leaving from the same place on the same day. As of March 6th, 1,169 through hikers had registered. Including my own, there appears to be around ten hikers starting on the same day as I am. This number is low, of course, since not everyone registers. Based on the graphs, I will be following a very large bubble of hikers who have/are starting in March. One last AT thing, I updated the Appalachian Trail tab to include state borders at the request of the Wife and Mother-in-Law. I had my annual blood work done. Most of my numbers were in the OK range but several of my numbers had creeped up since last time. This is a sure sign that I haven't been preparing for the AT enough. I imagine hiking for six months will work wonders for my numbers though I suspect some of the good will be countered by the high salt, high fat, and high sugar diet that I will be consuming on most of the AT. It will be hard to maintain good eating habits on the trail. On Wednesday I went out to lunch with my Mom. It had been a while (shame on me) and we had fun catching up and talking politics. On Friday I went for my only walk of the week. It was a gloomy day but I still enjoyed walking around the Carter Lake and Florence areas. I'm looking forward to getting out of the city and out into the wilderness in a few weeks. On Saturday I went with the Wife to Lincoln, NE to the Poetry Out Loud state competition. Her student, two time state champion. came in third this year. We still don't understand the scoring of the competition - first and second places came out of left field. This means the Wife will not be going to Washington D.C. this year. Those are the highlights. This coming week is quiet. I will finish my repackaging. I will try to get a couple walks in there as well. Oh ... and lot of purely natural anxiety, I'm sure. Appalachian Trail: What Have I Gotten Myself Into ?!? I am slowly ... too slowly really ... putting together a resupply plan for my Appalachian Trail (AT) hike. I am a month away from starting and things are just now starting to come together. Resupply is the most difficult. The Camino was so easy compared to this. This week I bought a small chest freezer so I could prepackaged some foods (Trail mix, jerky) to make it easier to ration while I'm hiking. I'd bought a vacuum sealer a few weeks ago and combining the vacuum sealing and the freezing should keep stuff fresh until that need to be shipped to me on the trail. The vacuum sealer also results in smaller packaging. Smaller packaging is important. I am really worried about getting everything into my 'bear proof' food bag. This week, after my weekly shopping, I will have everything available to fully pack my food bag to see if it will hold everything. It will be a tight fit. Today I started dividing up the food into first stage food and five resupply boxes. I first started with packing lists for each of the resupply boxes. I'd already came up with a meal plan earlier making it relatively easy to figure out what should go in each box. Along with food, some boxes will have shoes, clean socks and underwear, and seasonal clothing in some combination. As I was generating the packing lists I was going through the stages and came across several discrepancies in the earlier version of my plan. I ended up adding another stage (increasing the whole hike by one day) to divide up a large stage and shuffling a few stops to even out the lengths of other stages. Changing the stages in turned changed the amount of food in one of the resupply boxes. The result is version 3.0 of my plan which can be seen in the Appalachian Trail tab above. As I worked on all this I began feeling the pre-big adventure jitters. It happens every time. I think I've decided not to do the AT several times already. But I will do it despite all the creeping doubts. Who knows how many things I am overlooking or mistakenly taking for granted. Some things I can survive - I can buy what I need. Other things may be more difficult like finding food in small town grocery stores. Then there is will I be able to physically handle carrying so much weight up and down hills and mountains. So many doubts. I could just scream.